Poets, saints, and comedians have written about sleep throughout time, and it has a universal appeal. I am a big fan of sleep, although some nights it eludes me, teasing me with a short nod off, only to awaken in 10 minutes. Why is it that some nights it's easier to fall asleep than others? I've done some sleuthing, questioning friends, colleagues, acquaintances, and strangers about sleep and their relationship to it. There have been more and more studies about sleep and how essential it is for a healthy mind, body, immune system, and that lack of sleep can contribute to low grade depression, weight gain, inattention, lethargy. The list goes on.... there's even something called proper sleep hygiene, which simply means creating a ritual or a series of actions that you do to assist you in sleeping properly. Although a sleep ritual is as personalized as your nutrition and lifestyle choices, there are some key elements that have a universal application, and can become the foundation upon which you build your daily sleep routine. Maintain a regular sleep/wake up schedule. Try to go to bed and wake up around the same time each evening and morning, as this will help regulate the daily rhythm. Eat right and exercise. Avoid heavy meals and excess alcohol late in the evening, as this is known to disrupt sleep patterns. Make sure your bed is comfortable! This sounds like a non-issue, but so many people I've spoken with come to the realization that their bed is not comfy – too many blankets, not enough blankets, too soft, too hard. It's like the tale of the three bears…. you have to make your bed "just right." Lie on your back or in a comfortable position, close your eyes, and take a deep breath. Feel the air fill your lungs, your solar plexus, and your abdomen. Exhale slowly and purposefully. As you continue to breathe, access your body. Are there pockets of tension? If so, breathe into them and try to release. Are there any residual feelings like anxiety, upset, even happiness? If so, become aware of these feelings, and allow them to float away…you can return to them tomorrow, but for tonight, allow them to slip gently out of your grasp. Breathe deeply, and if need be, count to 5 on your inhale and count to 7 on your exhale. Allow your breathing to deepen as your release the day and embrace restorative sleep. I find that when I sleep well, I am present in my life. On days when sleep evades me, I try to find 10 minutes mid-day to close my eyes and relax…a mini pick me up, until I can hit the sheets in the evening. Then, I start my evening ritual over again. Happy August. While Dr. D'Adamo is on a well-deserved break, we are pleased to have a featured writer, Ruth Lanton, join us this month to write about stress and the Blood Type Diet. Ruth is a long-time follower of the diet, as well as a regular blogger on www.dadamo.com, and we are fortunate to have her join us as a contributor. The sympathetic nervous system (SNS) is responsible for the "fight or flight" response, while the parasympathetic nervous system (PNS) relaxes the body after the danger has passed. The two systems work in balanced opposition to each other. The SNS causes your heart to beat faster and harder, while the PNS slows down the heart, and relaxes the artery walls, allowing freer blood flow, and lets more oxygen get to the heart muscle. Most of the healing in the body happens when the PNS is in charge, including healing the subtle damage from normal "wear and tear" of life. Chronic stress often leads to the SNS being active for longer, and the PNS not engaging properly. Hormones are responsible for our response to stress. The adrenal glands release Adrenaline and Noradrenalin, which are short-acting hormones that speed up heart rate and blood pressure, reduce digestion, and make you more alert. In response to longer-term or more severe stress, the adrenal gland releases cortisol. This hormone enables the body to break down muscle to provide immediate energy. The proper levels of cortisol will reduce inflammation, reduce allergies, and promote healing. Too much or prolonged exposure to cortisol can lead to ulcers, heart disease, muscle loss, insomnia, and other ailments. High cortisol levels can cause "brain fog". It can also lead to obesity because it encourages the breakdown of muscle rather than fat. Here is a quick chart that gives you the beneficial exercises for each blood type. Each blood type has a very unique chemical profile, and that affects how our bodies respond to stress. While all of the blood types respond to stress by secreting more cortisol, Type As start out with a higher level in their blood all the time. Type As release more adrenaline in response to stress than other types, however, they also have the greatest ability to break down and eliminate it when the stress is over. They benefit from yoga and meditation to calm the nervous system. Type As need to be careful to avoid over-exercising, as too much vigorous exercise becomes a cause of stress, rather than a way to alleviate it. Type Os require a lot more to knock them off kilter in the face of stress, but once that happens, it usually takes them longer to recover. Os naturally have the lowest levels of cortisol of all the blood types. They also have lower levels of an enzyme that breaks down adrenaline and noradrenalin. Meditation is less likely to be helpful. Type Os are meant to release the built-up hormonal forces through vigorous and intense physical exercise. For those Os who are not currently healthy enough to undertake a strenuous exercise routine, any amount of movement is beneficial. Even a short walk can relieve stress and improve mental health. Tai Chi is often more helpful than yoga or meditation. Type Bs are similar to As in stress response. They tend to be very emotionally centered, and very sensitive to stress-related imbalances. They respond well to meditation and other stress-reduction techniques. Type ABs are more like Os in response to stress, but their exercise should not be quite as intense. For Blood Types B and AB, stress regulation and fitness is achieved with a balance of moderate aerobic activity and mentally soothing, stress-reducing exercises such as yoga or tai chi. Eating the wrong foods for your body is also a potential source of stress. Adhering to the Blood Type Diet helps to strengthen the body to adapt to stress better. Following the diet and exercise recommendations for your blood type can help you to live a healthy and happy life. Stress is part of all of our lives, and there are many different ways to combat its effects on us physically. In addition to eating and exercising right for your type, we have four products that were specifically formulated by Dr. Peter D'Adamo to support healthy stress regulation and optimal performance. 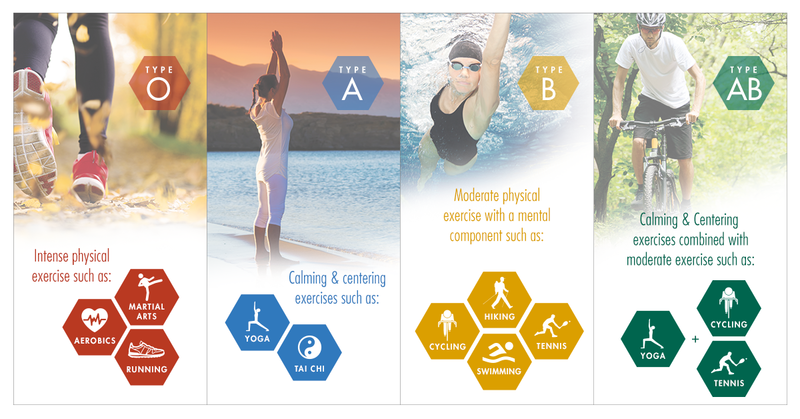 Taken separately or in combination based on your blood type, these products are essential elements for healthy living. Last week, Dr. D'Adamo presented a webinar on Personalized Nutrition and what it means for your health. And whether you've heard Dr. D speak before or never had the opportunity, it is always wonderful to listen to him lecture. He is articulate, funny, and you'll learn something new every time. Here's a recent article about the blood type that has appeared in recent news reports. This reinforces the value of personalized nutrition and the BTD in health and wellness and also in developing health strategies for specific diseases. Science is catching up to Dr. Peter D'Adamo! By now you might have heard of the Blood Type Diet. Dr. Peter D'Adamo created the diet and many other doctors recommend it, including Dr. Suneil Jain. If you thought knowing your blood group is unimportant, think again! From what to eat to which exercise is best for you, your blood is your life. There's a bumper crop of berries this year, and what is more refreshing than a crisp sherbet on a summer's day. Here's a simple and easy recipe from a gem of a cookbook – The Blood Type Diet Cookbook by Karen Vago & Lucy Degremont. In traditional sherbets, the fruit mixture is frozen; here we use frozen fruit to speed up the recipe. If you prefer to not use ready-frozen raspberries, buy fresh ones and freeze them for several hours. Ten minutes before making the sherbet take the raspberries out of the freezer – 15 minutes if they are whole and not broken into pieces. Pulse all the ingredients in a food processor. Scrape down the sides of the food processor bowl and pulse again to obtain a thick mass of sherbet. If the raspberries are small and not very sweet, you might need to add a little more sugar. The less sugar, the better. Editors' Note: We've substituted other beneficial fruits in this recipe, like peaches and blueberries, and it is great. Have fun with using your beneficial and neutral fruits. Source: The Blood Type Diet Cookbook by Karen Vago and Lucy Degremont, available on Amazon. 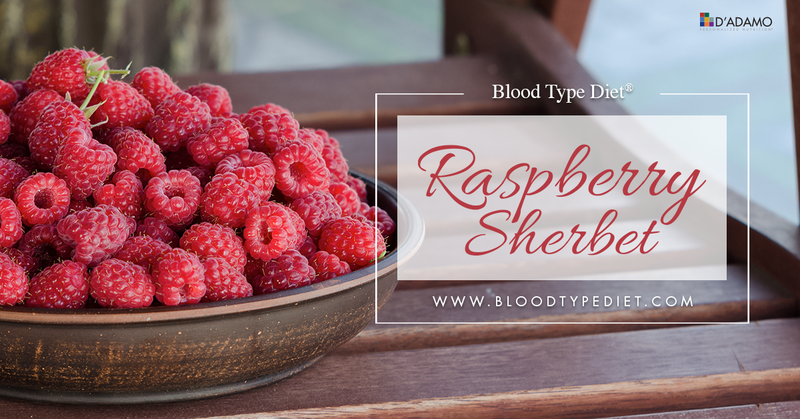 An excellent addition to your Blood Type Diet library.